Is tiny Teddy the luckiest pony in the world? Love at first sight for Georgina Bloomberg and her son, Jasper, for Teddy! A miniature horse once in the yard of a kill buyer has had a drastic turnaround in fortunes after being adopted by one of the wealthiest families in the US. Teddy has been adopted by Georgina Bloomberg for her son, Jasper. Teddy is the new pony of the five-year-old son of Georgina Bloomberg, whose father, former New York mayor Michael Bloomberg, is the 10th richest man in the United States. 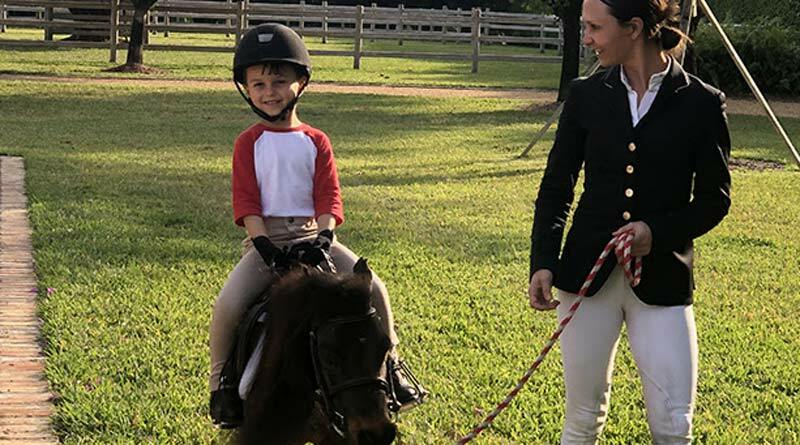 Georgina Bloomberg, a renowned international rider and animal welfare advocate, wanted to pique the interest of her son, Jasper, in learning to ride. She reached out to the Equus Foundation, a national charity dedicated to the welfare of horses in the US and fostering the horse-human bond. Bloomberg is also an “EquuStar” ambassador for the charity. Valerie Angeli of the Equus Foundation contacted Kelly Smith of Omega Horse Rescue, a member of its Equine Welfare Network, to enquire about Teddy, a miniature horse rescued from a kill buyer’s facility. Teddy was a sweet and docile horse who had been trained to be ridden and driven. “It’s a fate that so many wonderful horses tragically face and it just shouldn’t happen,” Angeli said. Teddy was saved from a kill buyer’s yard by Omega Horse Rescue. So just like that, little Teddy was adopted and shipped from Omega’s home base in Pennsylvania in mid January, looking like a little woolly mammoth in his fuzzy, winter coat. Teddy was met with excitement at Gotham South in Wellington, Florida, which is Bloomberg’s home base for her showjumping operation in winter. Teddy got a clipping and a makeover and was transformed into a heart-breaker. Jasper fell in love with Teddy at first sight and was ecstatic to have his first-ever riding lesson on the little gelding. “Thanks to the Equus Foundation and Omega Horse Rescue, watching Jasper take his first riding lesson with Teddy was one of the most joyful moments of my life. This is the perfect match,” Bloomberg said. Jasper, 5, had his first riding lesson on Teddy. What an adorable boy and his pony. Happy trails.